Are you looking for the best beginner micro quadcopter that’s inexpensive, durable, simple to learn and safe to fly indoors? Then one of these 5 most popular micro quadcopters may be a good choice. They may be small, but offer lots of fun both indoors and outdoors. It may not be the best idea to purchase an expensive quadcopter if your kids want to join you with your quad hobby or you are a newbie at micro quadcopters flying. To begin with, it is recommended to purchase micro quad to learn the basics and master the necessary skills. It makes them easy to take anywhere with tiny size and compact controllers. Also, it is very important to note that crashes are not so destructive. 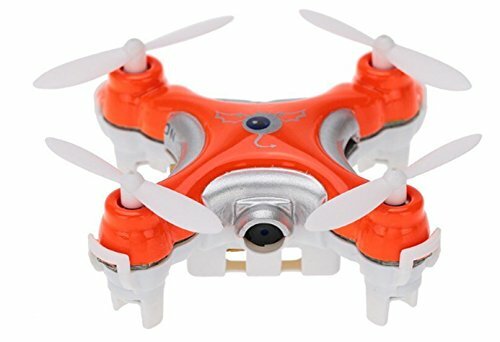 Some of these micro quadcopters are really inexpensive and available to buy so anyone can afford purchasing a few micro quads. You will be able to master each very fast and have great fun flying them. Bear in mind that most inexpensive micro quads offer the same features. They are every bit as stable and powerful as the larger quadcopters. Thanks to 2.4GHz transmitters and 4 channel controllers they offer about the same flight range. This feature allows you to move left, right, lower or raise forward, backwards and rotate your quad to the right or left. Furthermore, battery life is about 6 to 8 minutes and they charge using a USB connector in under 60 minutes. Also, propeller guards are great idea if you are learning to fly and want to decrease damage. They are equipped with internal gyroscope technology that allows for more stable flight. Finally, they have 2 mode operations – Beginner Mode and Expert Mode. With all the different micro quadcopters available for sale, choosing the best cheap micro quads to purchase is not a simple task, particularly if you are newbie. So we prepared the list of top 5 cheap micro quadcopters to help you save time and make your decision easier. The Proto X is one of the smallest quads available on the market at this time. It is a dependable and simple quad that’s easy enough for novices to pick up. This is a tiny quadcopter that you can fly round your office or home for fun. It comes ready to fly with its own controller right out of the box. This quad would make a perfect present for anyone just getting started with quads. The Proto X has a plastic body with trim and window detail. It is equipped with 3 gyros, 3 accelerometers and LED lights that indicate back and front. The LED lights will begin to flash quickly when it’s about to run out of power. At this point you have around one minute left of flight time before the quad slowly floats to the ground and stops. This quad also comes with 4 motor speed controls and a radio receiver. The main problem with this quadcopter is the size of the controller. It can be very hard to use if you have bigger hands. 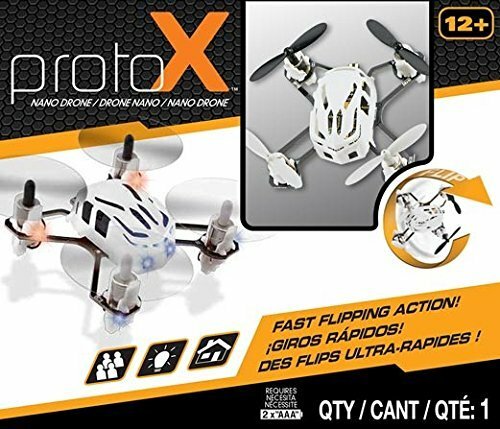 This is a simple tiny quadcopter without a camera and if you are looking for a micro quad with a number of cool features then the Proto X is not going to be the perfect choice. However, this quad should fit the bill perfectly if you are looking for a micro quad that is easy and fun to fly. This is my review and flight of the amazing new Estes Proto X nano quadcopter. I am pretty sure this is the world's smallest RC quadcopter, in production at least. The Cheerson CX-10C is another great micro quadcopter. The CX-10 has been around for a while and quad lovers are aware of this tiny quad. The manufacturer has now upgraded it and added a 0.3MP camera to capture videos and photos. This feature makes it one of the smallest quads to be equipped with a camera. At just 1.5 x 1.5 x 0.5 inches and 0.5 oz, the CX-10C is built with strong materials and durable enough for anyone to fly. Its silver and orange color is eye catching. This makes quad’s tiny body noticeable in the distance. The Cheerson CX-10C is not the best micro quad with camera for shooting photos or recording videos, it is still a cool tiny quad. It is equipped with a 0.3MP camera that can shoot photos and capture videos in VGA. The 6-axis flight control system with adjustable gyro sensitivity provides an extreme stable flight. It also enables you to „Throw to Fly“ just throw the quad in the air to begin the flight. 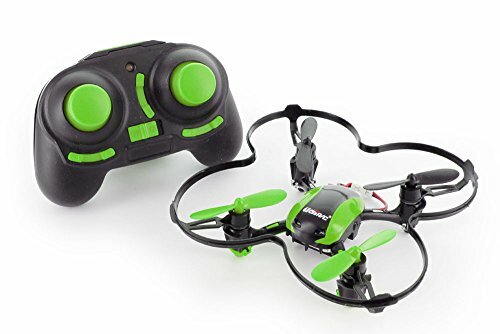 It has a game pad style radio controller with 3 flight modes – beginner, intermediate and expert. This quad can be flown right, left, up, down, hover, flip and sideways. Because this quad is so small, it flips really nice and tight. You can control the CX-10C using its 2.4G transmitter which has a control distance of 15 to 30 meters. The quad uses a 3.7V 120mAh battery which gives a flight time of around 5 to 8 minutes. This isn’t much, but the low charging time of about 15 to 20 minutes is very useful. The CX-10C even has LED lights for easier night flying. Review of the Cheerson CX-10C nano camera quadcopter (including video footage from the built-in camera). Currently the world's smallest camera quadcopter! The UDI RC U839 is built from impact resistant ABS plastic and. It also has 4 safety-protected propellers. Because of its lightweight and small size, this quad is easier to control than most mini sized crafts. It has great stability and strong wind resistance. The U839 features a 4-channel 2.4 GHz technology that helps in anti-interference. This is very useful because even if more than one quad is flying at the same time they will not interfere with each other. This quadcopter can even do flips and 360 degree rolls in any direction. You can even start its high-speed mode for outdoor racing. You can control this quad till a distance to around 30 meters. The U839 is an amazing micro quad to own and can fly both indoor and outdoor. At just 3.5 x 3.5 x 1.1 inches and 4.8 ounces it has a 6-axis system and 7mm coreless motor that allows the quad to be hand launched. Its 6-axis gyro quad-rotorcraft flight also helps it easily do different flight movements. The quadcopter uses a Li-Po 3.7V 150mAh battery that gives a flight time of about 5 to 7 minutes. It takes about 40 minutes to charge battery completely via a USB cable. The quad also has 4 LED lights that help the pilot indicate the direction in the night. They can also increase the visual perception of flight. Looking for a cheap micro quad that is simple to fly, powerful, stable and full of fun? WLtoys have this all in one tiny package. 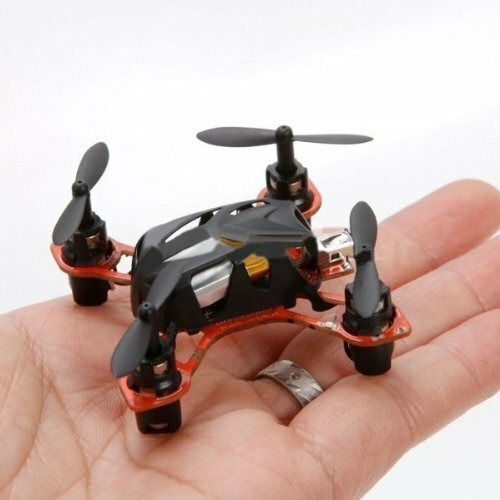 The WLtoys V272 micro quadcopter is one of the tiniest in the market. This quad is simple to fly and carry around due to its lightweight and portable and mini design. It is equipped with a 6-axis gyro that gives it great stability while flying and allows it to be hand launched. It also comes with 2.4GHz radio with LCD screen for trim settings that give you precise control. It has 4 channels and can go right and left, up and down, forward and backward. This micro quadcopter even has 360-degree eversion. The V272 is suitable for both indoor and outdoor flying. It also has strong interference resistance and a control distance of around 40 meters. Durable design and light weight gives you about 4 to 8 minutes of flight time. Its charging time is about half an hour and the quad can be charged very easily with the help of a USB cable. LED lights on all motors give you orientation and make it easier to spot the quad at night. The Estes Syncro X is a miniscule remote control quadcopter that is designed to fly indoors. Its tiny size fits easily in the palm of your hand. This quad is ready to fly right out of the box and does not need any setting up. Its extremely small size and light weight make it a nightmare to fly in even a low breeze. The Syncro X is extremely versatile and can roll from side to side and forward and backward. The quad comes with 4-channel digital trims. The quad’s radio remote transmits in the digital 2.4GHz spectrum and gives you total control over the quad and helps you command it the way you want. The Syncro X comes with the powerful 100mAh 3.7V Li-Po battery. The battery is neither upgradable nor swappable. With a full charge, the battery gives you around 5 to 7 minutes of uninterrupted flight time. The battery only takes around half an hour to charge completely. Durability is probably the biggest drawback. Fortunately, the Syncro X does come with spare propellers that can be changed at anytime. This tiny quad is equipped with 4 motors and 6-axis gyro with an „Auto Upright System“. This feature self-corrects the quad regardless of the direction that it was launched in. The Syncro X also comes with LED lights that help in night flying, while also indicating the front and back of the quad. This is my review of the Estes Syncro purchased from Walmart. Choosing the best micro quadcopter that is inexpensive can be a difficult task and we hope you have found this review helpful in your search for a best cheap micro quadcopter. Regardless of your choice, we hope you find a micro quadcopter that is cheap and that suits your needs.